From the time he was 13 years old, my grandfather put on tefillin every day. One day, when he was in his mid-20s, as a resident physician far from his childhood home, he rushed to the hospital one morning without having had the chance to pray. Seeing that not putting on tefiilin did not result in a personal catastrophe, he never put them on again. 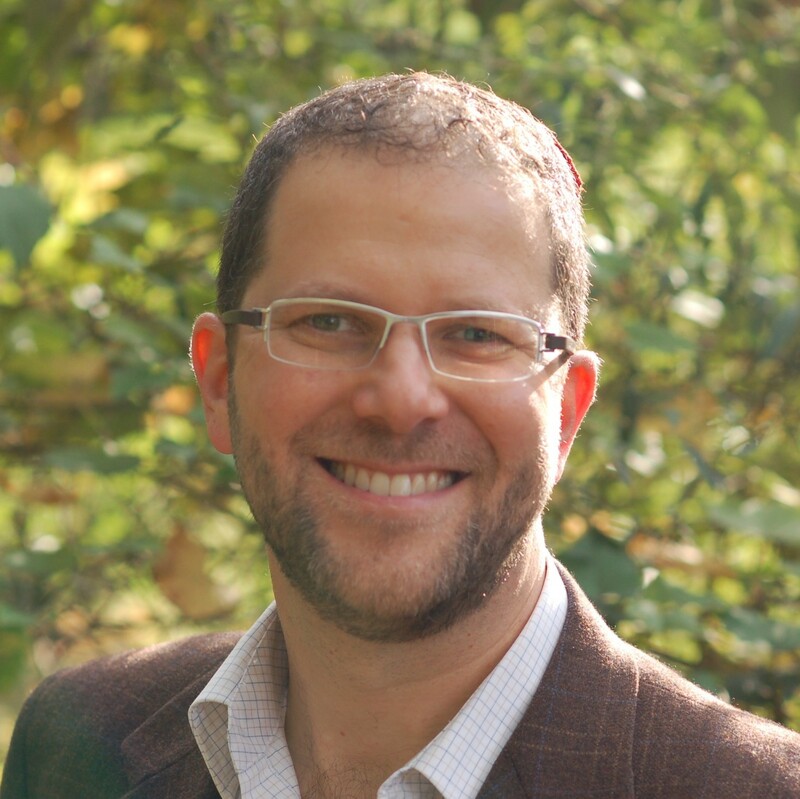 In my 20s, at approximately the same age in which my grandfather, immersed in the world of science and reason, gave up tefillin, I began putting them on each morning out of a search for meaning and spirituality. 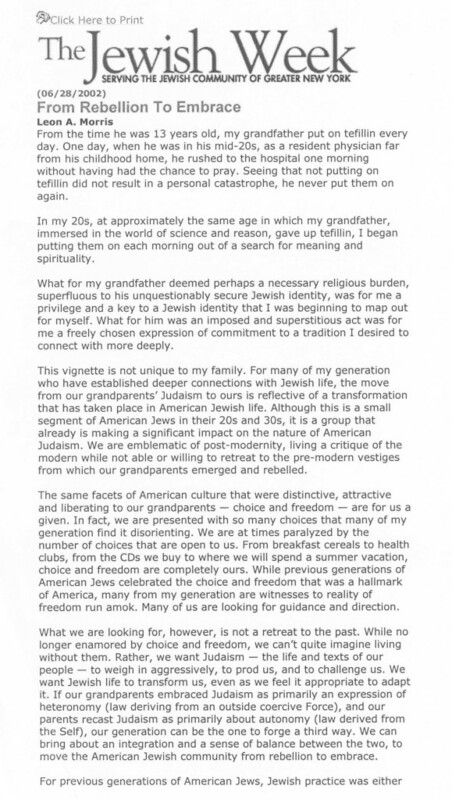 What for my grandfather deemed perhaps a necessary religious burden, superfluous to his unquestionably secure Jewish identity, was for me a privilege and a key to a Jewish identity that I was beginning to map out for myself. What for him was an imposed and superstitious act was for me a freely chosen expression of commitment to a tradition I desired to connect with more deeply. This vignette is not unique to my family. For many of my generation who have established deeper connections with Jewish life, the move from our grandparents’ Judaism to ours is reflective of a transformation that has taken place in American Jewish life. Although this is a small segment of American Jews in their 20s and 30s, it is a group that already is making a significant impact on the nature of American Judaism. We are emblematic of post-modernity, living a critique of the modern while not able or willing to retreat to the pre-modern vestiges from which our grandparents emerged and rebelled. The same facets of American culture that were distinctive, attractive and liberating to our grandparents — choice and freedom — are for us a given. In fact, we are presented with so many choices that many of my generation find it disorienting. We are at times paralyzed by the number of choices that are open to us. From breakfast cereals to health clubs, from the CDs we buy to where we will spend a summer vacation, choice and freedom are completely ours. While previous generations of American Jews celebrated the choice and freedom that was a hallmark of America, many from my generation are witnesses to reality of freedom run amok. Many of us are looking for guidance and direction. What we are looking for, however, is not a retreat to the past. While no longer enamored by choice and freedom, we can’t quite imagine living without them. Rather, we want Judaism — the life and texts of our people — to weigh in aggressively, to prod us, and to challenge us. We want Jewish life to transform us, even as we feel it appropriate to adapt it. If our grandparents embraced Judaism as primarily an expression of heteronomy (law deriving from an outside coercive Force), and our parents recast Judaism as primarily about autonomy (law derived from the Self), our generation can be the one to forge a third way. We can bring about an integration and a sense of balance between the two, to move the American Jewish community from rebellion to embrace. For previous generations of American Jews, Jewish practice was either embraced or rejected on the premise that Judaism was based upon a claim for the Truth. Such claims don’t speak to us in the same sort of way. For us, Judaism is largely about meaning. Having grown more modest of our ability to apprehend Truth, and skeptical of those who claim to know where it is to be found, what we seek is inspiration. If previous generations of American Jews read Judaism in more literal and prosaic ways, even as they found it increasingly irrelevant, our generation reads it as poetry, elucidating pertinent insights that lie beneath the surface. For Generation Xers who are “new Jews” of sorts, the novelty of Jewish practice brings with it a sense of absence or loss as well. While Jewish life and practice may occupy a larger space in our schedules, undoubtedly it is lived in more contrived ways that reflect the uniquely American milieu in which we live. For my grandfather, being a Jew was organic and natural. It was simply what he was, from his neighborhood, his frames of reference and the language he spoke. For me, almost every aspect of being Jewish is a choice much like my tefillin. Such a reality lacks the quality of authenticity we also crave. By “recovering” practices that we ourselves did not grow up with, we lack that true sense of continuity that marked and defined generations of Jewish practice. Our embrace of Jewish life then, while perhaps “traditional” in form, is both distinctly American and unarguably contemporary. 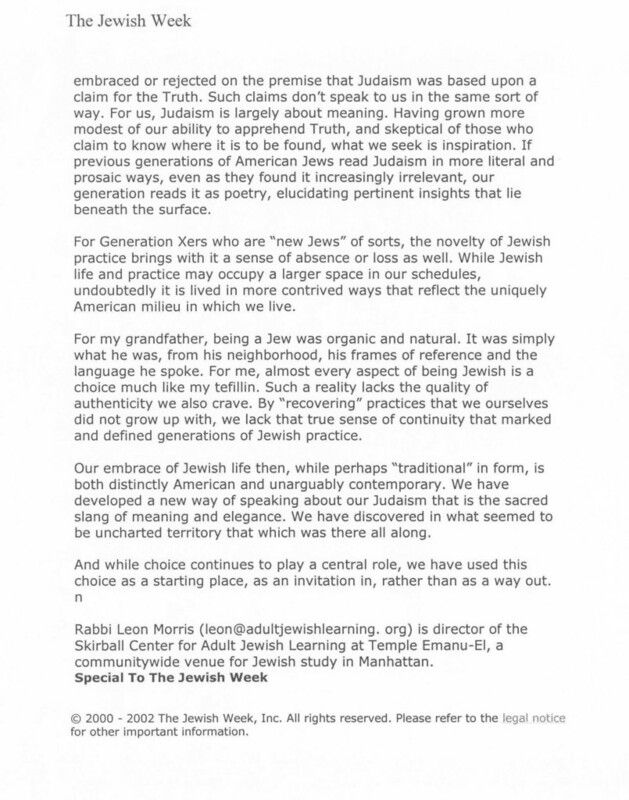 We have developed a new way of speaking about our Judaism that is the sacred slang of meaning and elegance. We have discovered in what seemed to be uncharted territory that which was there all along. And while choice continues to play a central role, we have used this choice as a starting place, as an invitation in, rather than as a way out.